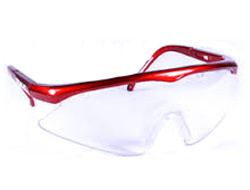 There is one standard for all safety eyewear in the United Kingdom whether they are used in industry or sports. However, we have personally tested these models to be especially good for sports. 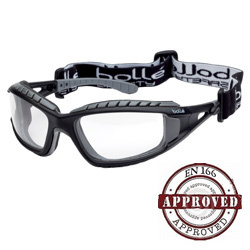 As a brand, Bolle is especially well placed since they are one of very few companies that develop their own glasses for both industry and personal use. They are all ultra lightweight polycarbonate, shatter resistant and meet the necessary guidelines for protection against impacts and UV. We sell many pairs to for football, skydiving, mountain biking, squash, rifle shooting and much more! 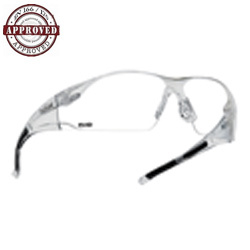 Since the Cobra has also been designed to be adapted into a safety goggle, these glasses use extra strong B-rated lenses and make them highly popular in the medical profession. 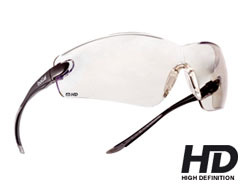 They are available in every lens type including the new High-Definition, making them the most versatile model we have. A combination of style, comfort and protection. The Rush offer all of this and more. 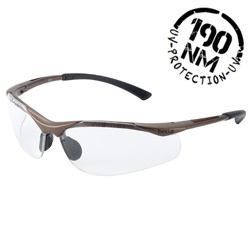 A combination of an extra comfortable nose bridge and flexible temples mean these sporty glasses can be used in most environments. They come in clear, smoke, HD and twilight lenses. A combination of a sporty style and a slightly smaller frame size. Ideal for the female safety glasses wearer. The Rush+ Small have a combination of an extra comfortable nose bridge and flexible temples mean these sporty glasses can be used in most environments. They come in clear lenses. 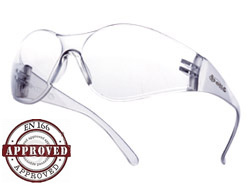 The Spider, a relatively new model entering the safety eye-wear market, boasts a very high specification. A large viable area and wrap-around design make them an overall excellent safety spectacle including the introduction of the new Flash lens. 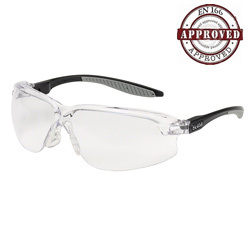 At only 21g the Contour is arguably the lightest pair of safety glasses in the world and yet retains the highest level of quality and exceeds safety standards. 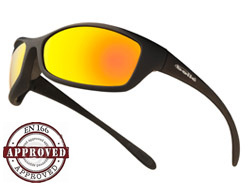 They also protect against UV more than almost every other pair of glasses on the market. They are also available in four different lens types for a range of applications. 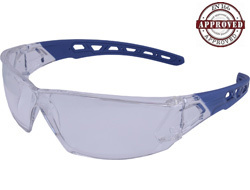 The AXIS is the most adaptable pair of safety glasses on the market with an adjustable nose bridge and pivoting arms. Available in clear, smoke and contrast lenses. The Bandido offers a huge visible area and integral side protection due to their full wrap-around design. Each pair is supplied with an adjustable neck cord to ensure they stay firmly in place during rapid movements or when working at various angles. 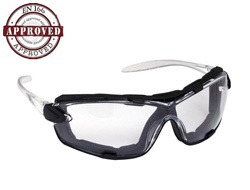 The highly popular Cobra safety glasses have been adapted here to become a full safety goggle. Arms have been replaced with an adjustable strap and the lens sealed with special foam to give full EN166 protection to liquid splashes and droplets making them popular for laboratory and dentistry work. They are highly popular in sports such as skydiving and mountain biking. A leading specialist UK manufacturer of sports wear for squash, tennis, badminton and racketball. Their Titan range of eye protection is available for both adults and juniors so that you can play the racket sport you choose and know you are fully protected. They come in a variety of colours are approved by England Squash and come with a head strap and microfibre pouch as standard. From the well known brand Dunlop comes a one size fits all alternative for Junior sports eye protection. Approved by the world squash federation and suitable for racketball these versatile safety glasses come with flexible case and strap for added comfort. 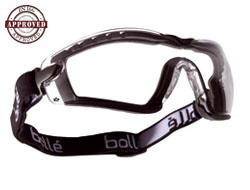 These are glasses, however they satisfy the requirements for goggles as they have the strap in place. 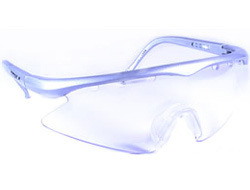 One of very few safety glasses in the world that meet safety goggle standards. A removable head-band keeps the glasses tightly fitted to face and micro-foam lens edges give full dust protection in addition to making them extremely comfortable. 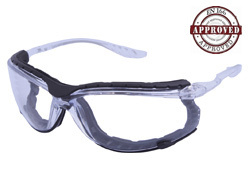 Very popular in the medical field given that normal goggles can be cumbersome. 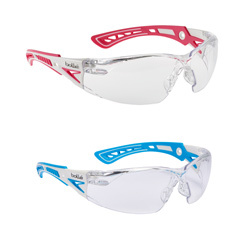 Multi purpose sports style safety glasses that stand out from the crowd. As well as the features you would expect from premium safety glasses these come with a new indoor / outdoor lens tint so no need for another pair! Really a hybrid glass and goggle. You can interchange between side arms, head strap and foam gasket to fit your needs. With a wraparound design and being light weight it really can suit most settings. 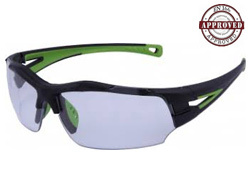 Sports style safety glasses with a wraparound design. 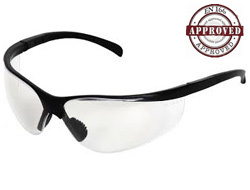 A very comfortable and efficient pair of safety glasses that can be worn in most scenarios all day if needed. These really look like they were developed to play sports in rather than work in. With a wraparound close fitting style. 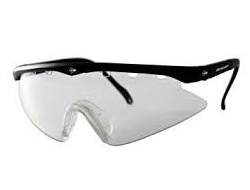 But as Safetyglasses they have extendable arms for extra comfort and an extra soft nose bridge. Another light weight pair of glasses in the Marmara style. It has a wraparound deisgn and comes with foam inserts for extra comfort. Comes with neckcord for added ease of use. Unsure which each lens type is best for you? Why not see our advice section before deciding? Next day delivery on all orders placed before 2pm! Secure Website Payments by HSBC & Verisign.